Ladies Small Group meets at Cathy Bobar’s home, 112 Blue Shank Road, Summerside, 7pm on Mondays. 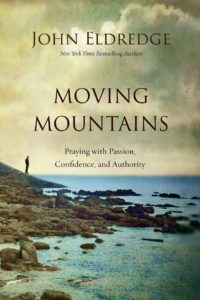 This years study is Moving Mountains by John Eldredge. Everyone has a reason to pray. We long to see God come through for us and those we love. But sometimes he doesn’t, and where does that leave us? Are we doing something wrong? Does he not hear? How come some people’s prayers seem more effective than others? Then we lose heart and give up on prayer—the very weapon God has given us to not lose heart. If you are interested in prayer at all, you want prayer that works. That is the kind of prayer at the center of this book. When we discover that prayer is not just asking God to do something—prayer is partnership with God—new possibilities open before us. We are God’s sons and daughters, given the authority of Jesus Christ; we have a greater role in prayer than we ever thought. Greater power, too. In this eight-session study, John Eldredge shows there is a reason why some prayers are more effective than others. Part devotional, part adventure story, part field manual, Moving Mountains will show you how to experience the power of prayer.